Spanning twelve hundred kilometres from New Brunswick’s Passamaquoddy Bay to Newfoundland’s Avalon Peninsula, Atlantic Canada stands as a nexus between North America and the North Atlantic. Its diverse geography, variable climate, and ocean currents coalesce to create a rich medley of habitats both on land and in the sea. 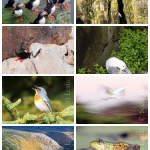 Scott Leslie, renowned Nova Scotia author and nature/wildlife photographer, will present a selection of the diverse wildlife photographs found in his latest book, and will speak about some of his experiences capturing this natural beauty in pictures. In addition, he will present some of his new work on habitats from the air not found in the book. A Q&A Session will follow and Scott will be available afterwards to sign any of his books you may have. Our annual Holiday Social will follow. See Walks & Talks page for more details. Posted: December 2nd, 2017 under Talks.